Fixing the mental health system is a key part of a plan Vermont Gov. Phil Scott’s administration introduced to the State Legislature in January to build a 925-bed prison complex in northwest part of the state over 10 years. Fifty forensic beds — 20 reserved for hospital level care and 30 for outpatient or residential level care — are part of the $150 million corrections campus outlined in the Agency of Human Services (AHS) Report on Major Facilities. AHS oversees both the Department of Corrections and the Department of Mental Health. The plan to create the large complex in Franklin County by 2028 also calls for 457 beds for male inmates, 175 beds for female, 120 beds for federal offenders, and 50 Americans with Disabilities Act-compliant beds for aging/infirm men. There also would be three booking and receiving beds and 18 infirmary beds, including two hospice and three quarantine. An additional 25 beds for youth offenders is part of the plan if the state does not rebuild the Woodside Juvenile Rehabilitation Center adjacent to the current facility in Essex. Vermont lost Medicaid funding for Woodside in October 2016 after federal regulators deemed it a correctional facility and not an appropriate therapeutic setting for youth ages 10 to 18 in the custody of the Department of Children and Families. HS Secretary Al Gobeille said funding for a replacement for Woodside would be included in a two-year capital bill Scott would present to the Legislature next January if re-elected this year. If not, the 25 adolescent beds would become a separate unit in the large prison campus. “We’ve been clear in the report and with the Legislature that we don’t know if it’s the right size, we don’t know if they’ll agree with us on location, we don’t know if they think the timing’s right,” Gobeille said. All four of Vermont’s high acuity mental health treatment facilities have critical problems, the report states. 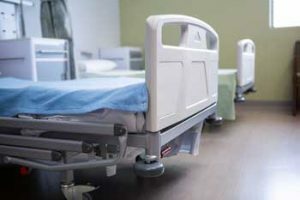 In addition to the funding problems with Woodside, both the Vermont Psychiatric Care Hospital (VPCH) in Berlin and the Brattleboro Retreat are at risk of losing Medicaid funding in 2021. The plan’s 20 additional hospital-level forensic beds would increase bed capacity throughout the state by 10 percent. That would relieve stress on emergency rooms. Since the state had to close the 54-bed Vermont State Hospital in Waterbury in 2011 after it sustained heavy flooding damage during Tropical Storm Irene, spikes in mental health patients seeking treatment in hospital emergency departments can mean long waits for beds to open up at an appropriate treatment facility. Gobeille said nearly half the 25 VPCH beds are used for court- involved people who could instead be treated in the proposed new forensic psychiatric facility, increasing capacity for the civilian population. Under the plan, the state would close the Chittenden Regional Correctional Facility and the Northwest State Correctional Facility. The project could eliminate the need to place offenders out of state while beds for federal detainees could generate revenue from the federal government. The report outlines an estimated $117.5 million in cost savings over the next 20 years from shared administration and economy of scale, including consolidating specialized units state-wide. Health services staff would be concentrated in one place to address aging and infirm inmates and the correctional forensic population. according to cost summary assumptions outlined in the report’s appendix. Gobeille acknowledged the difficulty of finding adequate skilled staffing for a large prison complex in a state where the unemployment rate is one of the nation’s lowest. Vermont’s unemployment rate was 2.8 percent for December 2017, the second lowest in New England after New Hampshire. The presence of a large academic medical center and higher education institutions in the more populated northwest region of Vermont may help workforce recruiting efforts, Gobeille said. “People have said, ‘How are you going to staff this?’ That has been talked about in a lot of rooms so that is a major concern of people and is something we’re going to have to work through,” Gobeille said. The Vermont Psychological Association has so far taken no position on the prison complex proposal. Barnett added he would be willing to provide information if asked to testify before the Legislature. He said the workforce capacity issues raised by the plan could help the VPA’s uphill battle to gain prescriptive authority for psychologists. A House bill proposing to allow the Board of Psychological Examiners to confer prescribing authority upon doctoral-level psychologists who have completed specific educational and training requirements was not taken up last year. A Senate bill proposing the same thing was introduced in January. “Any time that the state wants to open up more beds or things like this where mental health services are needed, there’s still a problem with access to psychiatrists and psychiatric nurse practitioners,” Barnett said.